I’ve been accused of making supposedly inconsistent arguments against Hillary Clinton. Make up your mind, these critics say. Is she corrupt or is she a doctrinaire leftist? I always respond with the simple observation that she’s both. Not that this should come as a surprise. Proponents of bigger government have long track records of expanding their bank accounts at the same time they’re expanding the burden of the public sector. This is true for radical leftists in places like Venezuela and it’s true for establishment leftists in places like America. And it’s definitely true for Hillary Clinton. I shared lots of information about Hillary’s corruption yesterday, so let’s spend some time today detailing her statist policy agenda. Consider her new entitlement scheme for childcare. 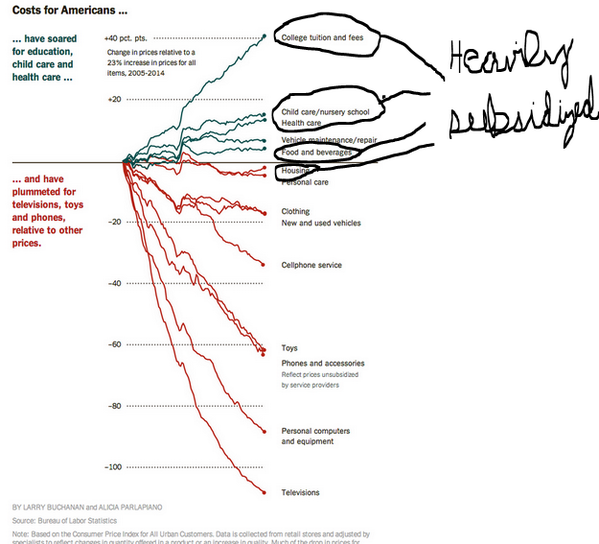 As the Wall Street Journal opines, it’s even worse than an ordinary handout. Hillary Clinton is methodically expanding her plans to supervise or subsidize those remaining spheres of human existence unspoiled by government. Mrs. Clinton rolled out her latest proposal…to make child care more affordable for working parents and also to raise the wages of child-care workers. The Democrat didn’t mention how she’d resolve the contradiction between her cost-increasing ideas and her cost-reducing ideas, though you can bet it will be expensive. …Her solution is for the feds to cap the share of a family’s income that goes toward care at 10%, with the rest of the tab covered by various tax benefits, direct cash payments and scholarships. Her scheme to cap a family’s exposure so they don’t have to pay more than 10 percent may be appealing to some voters, but it is terrible economics. Although we don’t have details on how the various handouts will work, the net effect surely will be to exacerbate a third-party payer problem that already is leading to childcare costs rising faster than the overall inflation rate. After all, families won’t care about the cost once it rises above 10 percent of their income since Hillary says that taxpayers will pick up the tab for anything about that level. There’s more information about government intervention in the editorial. The auditors at the Government Accountability Office report that there are currently 45 federal programs dedicated to supporting care “from birth through age five,” spread across multiple agencies. The Agriculture Department runs a nursery division, for some reason. …Mrs. Clinton also feels that caregivers are paid “less than the value of their worth,” and she promises to increase their compensation. How? Why, another program of course. She’ll call it the Respect and Increased Salaries for Early Childhood Educators (Raise) Initiative, which she says is modelled after another one of her proposals, the Care Workers Initiative. …If families think day care and health care are “really expensive” now, wait until they have to pay for Mrs. Clinton’s government. Just as subsidized childcare will be very expensive if Hillary gets elected, the same will be true for higher education. But in a different way. The current system of subsidies and handouts gives money (in the form of grants and loans) to students, who then give the money to colleges and universities. This is a great deal for the schools, who have taken advantage of the programs by dramatically increasing tuition and fees, while also expanding bureaucratic empires. Hillary’s plan will expand the subsidies for colleges and universities, but students apparently no longer will serve as the middlemen. Instead, the money will go directly from Uncle Sam to the schools. Here’s some analysis from the Pope Center on Hillary’s new scheme. As with much of Hillary’s agenda, we don’t have full details. I strongly suspect that colleges and universities will have a big incentive to jack up tuition and fees to take advantage of the new handout, though I suppose we have to consider the possibility (fantasy?) that the plan will somehow include safeguards to prevent that from happening. Oh, and don’t forget all the tax hikes she’s proposing to finance bigger government. The really sad part about all this is that her husband actually wound up being one of the most market-oriented presidents in the post-World War II era. I’ve written on this topic several times (including speculation on whether the credit actually belongs to the post-1994 GOP Congress). Is it possible that Hillary decides to “triangulate” and move to the center if she gets to the White House? Yes, but I’m not brimming with optimism. The Wall Street Journal has some depressing analysis on Bill Clinton vs Hillary Clinton. …the Obama-era Democratic Party has repudiated the Democratic Party’s Bill-era centrist agenda. They now call themselves progressives, not New Democrats… The Clinton contradiction is that she claims she’ll produce economic results like her husband did with economic policies like Mr. Obama’s. The editorial looks at Bill Clinton’s sensible record and compares it to what Hillary is proposing. His wife wants to nearly double the top tax rate on long-term cap gains to 43.4% from 23.8%, in the name of ending “quarterly capitalism.” That’s higher than the 40% rate under Jimmy Carter, and she’d also impose a minimum tax on millionaires and above, details to come. …Mrs. Clinton has repudiated the Trans-Pacific Trade Partnership that she had praised as Secretary of State. …She wants to extend Dodd-Frank regulation to nonbanks, and she promises to entrench Mr. Obama’s anticarbon central planning at the EPA and expand ObamaCare with price controls on new medicines. …Mrs. Clinton is proposing to impose many more such work disincentives. She’ll bestow tax credits on everything from child care to elderly care, from college tuition to businesses that share profits with workers. To the extent her new mandates for family leave, the minimum wage, overtime and “equal pay” increase the cost of labor, she’ll drive more Americans out of the workforce. Oh, and…Mrs. Clinton wants to “enhance” Social Security benefits and make Medicare available to pre-retirees. I’ve already written about her irresponsible approach to Social Security. And I also opined on the issue in this interview. The bottom line is that we’re in a very deep hole and Hillary Clinton, simply for reasons of personal ambition, wants to dig the hole deeper. As I remarked in the interview, she’s akin to a Greek politician agitating for more spending in 2007. Given all this, is anyone surprised that “French President Francois Hollande endorsed Hillary Clinton”? What’s next, a pro-Hillary campaign commercial featuring Nicolas Maduro? A direct mail piece from the ghost of Che Guevara? And you’re going to vote for who? Look- only one of two people is going to win this election. It’s going to be Hillary or Donald. If its Donald, we are rolling the dice to see what might come. With the exception, of course, that he has promised to fix a handful of specific things. If it’s Hillary, we know we’re hitting the drainhole faster. Choose wisely, Dan. I’m always a lesser of two evils kind of guy. Given the choice of a guillotine or being throw into a rapidly running river- I would take the river. It has a chance of survival. Thanks as always. It is so hard to rend the veil of deceit wide enough to expose the corruption beyond. Stop being so easy on her… My attempt at a joke. Keep speaking the truth, more people hear than you would believe.